For the longest time any product with the word 'glow' in the name or description would send shivers down my spine. My face is prone to becoming an oil slick, so I thought that a glow-y look just wasn't for me. However I've since discovered the 'matte glow' (yes, I just made that up), which is a way to get a radiance to your skin without any sort of glitter or dewiness. These products are perfect for combination and oilier skin types if you want to turn your shine into glow. Firstly you'll want to start with a primer to stop your makeup slipping/melting down your face during a long day (you know what I mean!) I like the Body Shop Instablur Primer (£14, review here) as it's one of the few that reduces my shine as well as reducing the appearance of large pores and imperfections. I often find that primers billed as 'matte' are such a dry consistency that they don't really do anything to smooth out the surface of my skin. If you find this too then I really recommend Instablur. If you don't like or wear primer then you can skip this step! My everyday foundation is Nars Sheer Glow (£31, review here). I didn't get this foundation for aaages as the name made me think it would have a dewy finish however it doesn't at all, I can best describe it as 'satin'. It makes your skin look radiant and glowing without any sort of shine or 'wetness'. At this point I blot my face with the Essence All About Matt Oil Control Paper (£2). I don't like doing this at the end as I find it can disrupt and smudge my finished face of makeup and I don't find that the products I apply after foundation really add any shine to my face. The concealer I really recommend for oily/combination skin is the Nars Radiant Creamy Concealer (£22, review here). I don't find it creases at all and it gives really amazing coverage. The drier texture makes it ideal if you're prone to facial shine. I then finish off my base with the Bourjois Healthy Balance Compact Powder (£8.99) which eliminates the shine in my t-zone especially without leaving my skin looking flat. It can be really hard to work with cream formulas on oilier skin types, so instead of that I recommend a highlighting powder blusher to get a bit of radiance into your skin. My favourite is the Hourglass Ambient Lighting Blush in Luminous Flush (£28) as it applies to my skin evenly without it being any effort at all and doesn't rub off or go patchy during the day. A drugstore alternative would be the Max Factor Creme Puff Blush in Seductive Pink (£8.99, buy here). This next step isn't really necessary for an everyday look but if you want to go the extra mile, these are the highlighter and bronzer products I recommend for shine-prone skin. For bronzer I recommend the Makeup Revolution Vivid Baked Bronzer in Ready to Go (£4). It's pretty much the definition of 'matte glow', giving a sheeny golden radiance without a hint of shimmer or dewiness. These remind me a lot of the Laura Mercier ones. For a highlighting setting powder I recommend the Hourglass Ambient Lighting Powder in Dim Light (£38, post here). As I've mentioned previously, I do think this is overpriced for what it is but it's nice to have if you fancy a treat. As with the blushes, some of this range does have glitter in but not Dim Light. It's a neutral-beige sheeny powder that gives your skin a real radiance. A similar but cheaper option would be the Makeup Revolution Radiant Light Powder in Breathe (£5, buy here). 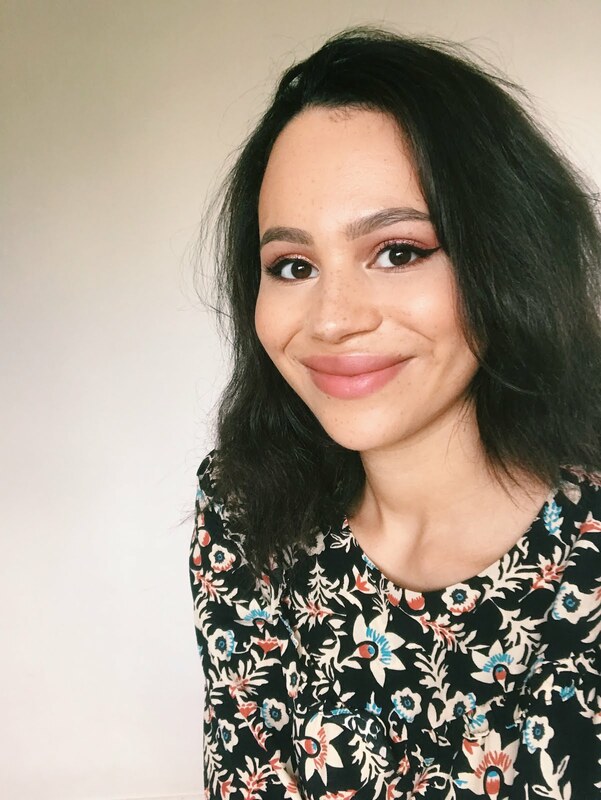 I've swatched some of the products below and with the exception of the blusher this is the look I'm wearing in my profile image! I am more combination than full-on oily but with this base I don't even have to re-apply powder during the day, which is pretty much unheard-of for me. It takes around 10-12 hours for the first signs of shine to start coming through, meaning it's not something I have to keep worrying about when I'm busy at work or on the go. What are your tips for getting glowing skin without the shine? InstaBlur is so good! I usually use it on my nose to get it perfectly smooth. ;) I have normal/dry skin so cannot comment on the part of oily skin, but you have gorgeous selection here! I definitely struggle with that! I need to mattify my skin first, in order to add a healthy glow, which I do with my maxfactor creeme puff blush and highlighters such as the Watts Up from benefit or my Mary-Lou Manizer! Such beautiful products recommended. I really want to try ambient lighting powder and blush. I've heard such good things and the packaging is gorgeous. Definitely going to get the NARS foundation and concealer now. I've been put off getting them for a while. Perfect! That is exactly it too. You don't need to be oily to be "glowy". And these are great products to create that look. So many gorgeous products here, and some great bits of info too! The more I hear about NARS the more I am itching to buy a something from them! Love all the products you've mentioned here and t's a very subtle way to give yourself a bit of a glow with out you looking like a frying pan! I have normal skin but I hate any sight of glitter on my face so I will try to take some of these tips and tricks into consideration! Dim light looks amazing! Definitely want to give that a go! Great review! I really want to try the Nars concealer, i've heard so manh good things about it. And the Hourglass Luminous Flush looks so pretty! 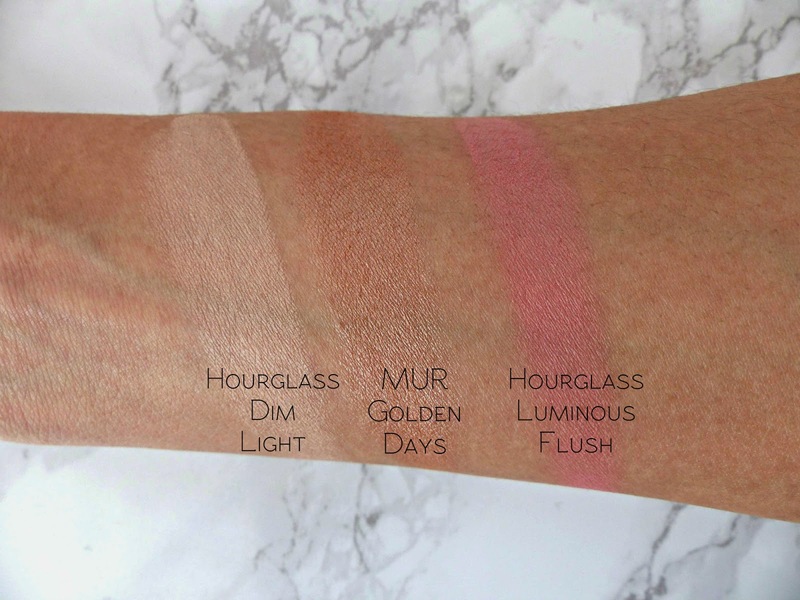 I NEED the HourGlass Dim Light in my life, I keep seeing all these reviews. I've been skeptical about the Nars Sheer Glow, as I too have Oily/Combo Skin, so good to hear it isn't too dewy and more satin. Will look into it. This is a very smart post! A lot of people get scared of 'glowing' skin. It be done in so many differnt ways. Great suggestions. Also I agree Sheer Glow is Satin, not dewy. The blushes look so pretty! Thanks for sharing! I really want to try that primer! I also need to pick up the Makeup Revolution highlighter, it looks beautiful. Ooh I so want to try the bodyshop instablur! That Make Up Revolution baked bronzer looks gorgeous! 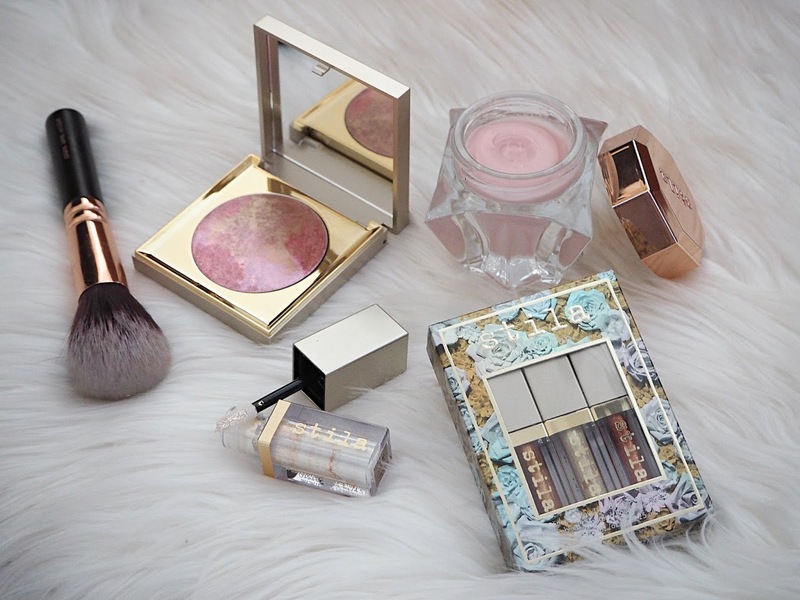 I've been loving the matte glow recently as well, being oily means I've always gone for mattifying products but I've been loving adding a bit of glow back in recently, especially with blush/highlight and a bit of bronze and gold eyeshadow. A good primer is definitely essential. Fantastic tips! 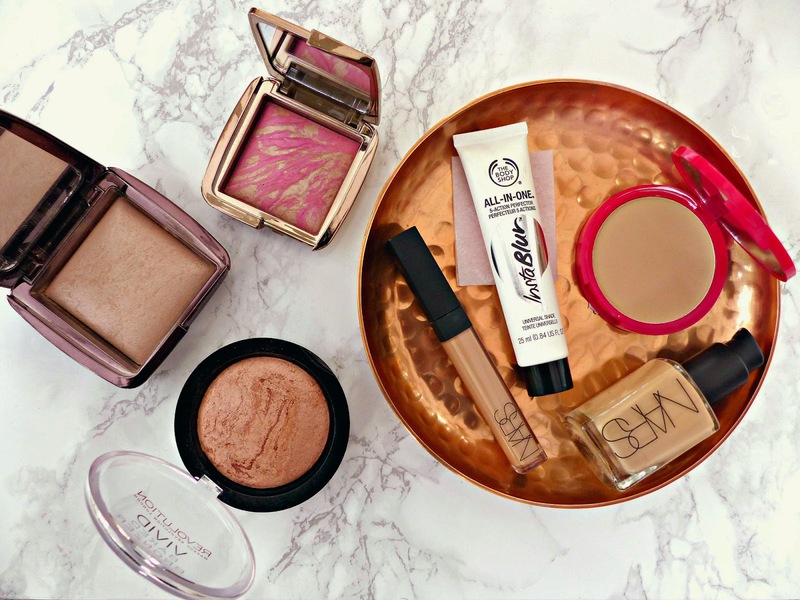 I have super-duper oily skin, I'm definitely going to have to try InstaBlur, and the NARS Sheer Glow foundation sounds fab - I've always been put off by the name, too! I'm interested in Instablur. I cannot wait to go to UK and clean out all the products in The Body Shop. Both of those Hourglass powders look gorgeous, and I need to get my hands on Instablur!